I have written about a couple of corner shops during the last few months, and for today’s post it is another shop, but this one in the middle of a terrace. This is French’s Dairy in Rugby Street. The above photo was taken in 1986 when the shop sold general dairy products as well as other daily essentials. 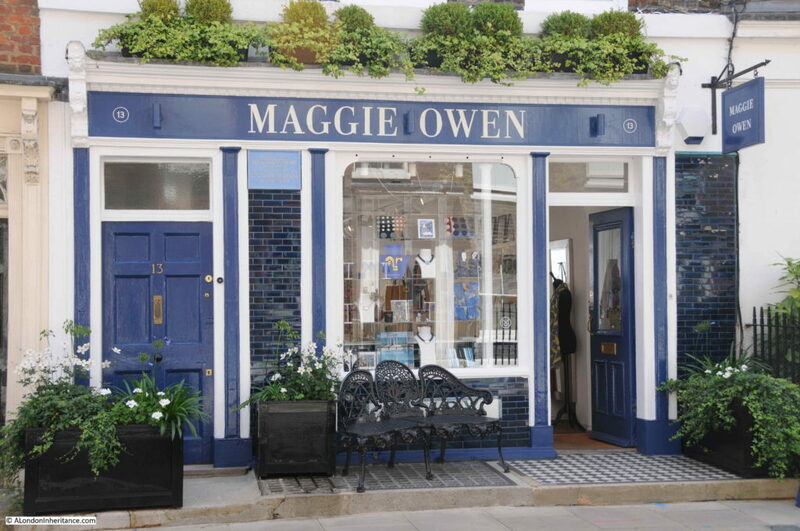 The store closed in the 1990s and for the last few years has been the shop of designer Maggie Owen. The shop front looks much the same as it did 32 years ago, apart from the name change. 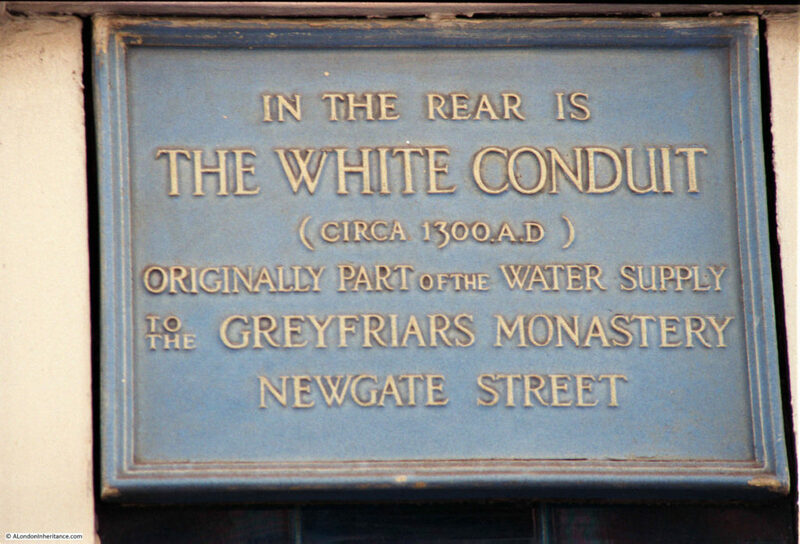 The plaque recording the building as the location for part of the White Conduit is still on the shop front. 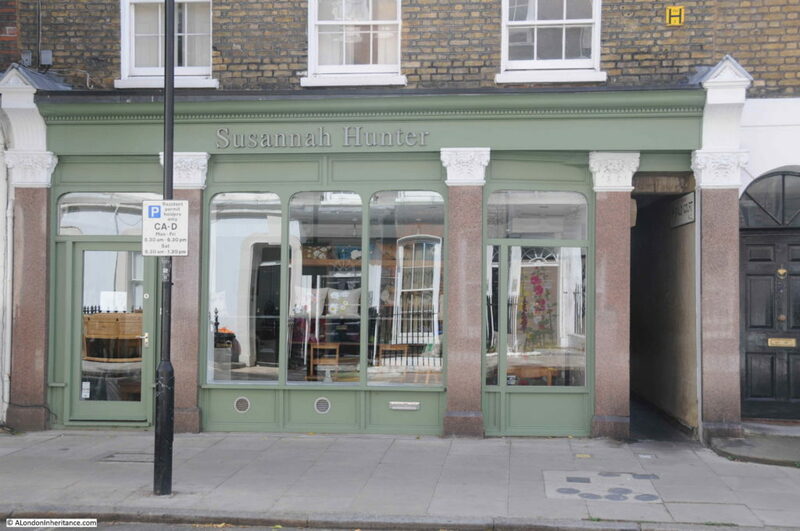 I did ask in the shop if there is any visible evidence and I had much the same response as London Remembers – that the remains of the conduit are below the floor and cannot be seen. As the plaque informs, the conduit provided water from what was the countryside around the city to the Greyfriars Monastery. The remains under the shop were apparently discovered in 1907 and consisted of a stone chamber and tank with an arched roof of chalk. I find it fascinating looking back at the displays in these old shop windows. The pile of milk crates in front of the shop is a sight you would not see today. 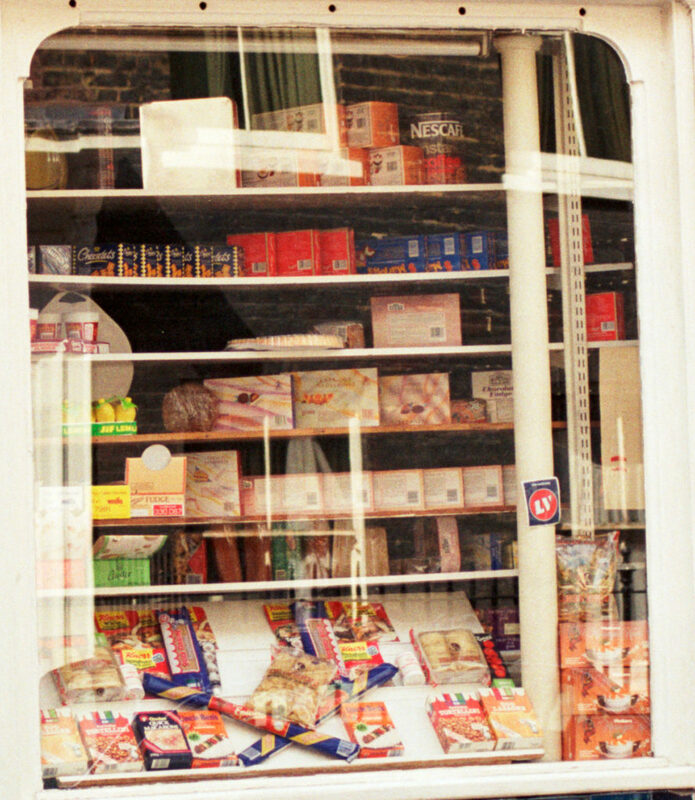 The shop windows always seem to consist of a random display of products, and in 1986 French’s Dairy had on display a rather large tin of Nescafe Instant Coffee, several boxes of Cheeselets, Mr Kipling Cakes, Fudge, Uncle Ben’s rice and Quick Macaroni. 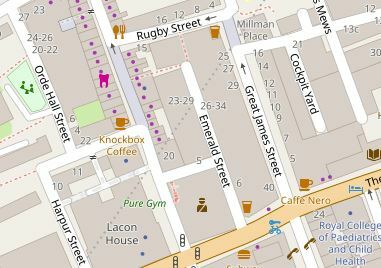 Rugby Street is north of Holborn, just north of Theobalds Road and was built as part of the early 18th century expansion of London. The southern side of the street consists of a lovely terrace of period houses, many, as with French’s Dairys, with later shop fronts. This is Emerald Court and is one of narrowest alleys, if not the narrowest in London. I had already prepared for visiting Rugby Street by bringing with me a tape measure (yes, I know – taking this a bit too seriously), and the width of the entrance onto Rugby Street is about 68 centimeters wide. 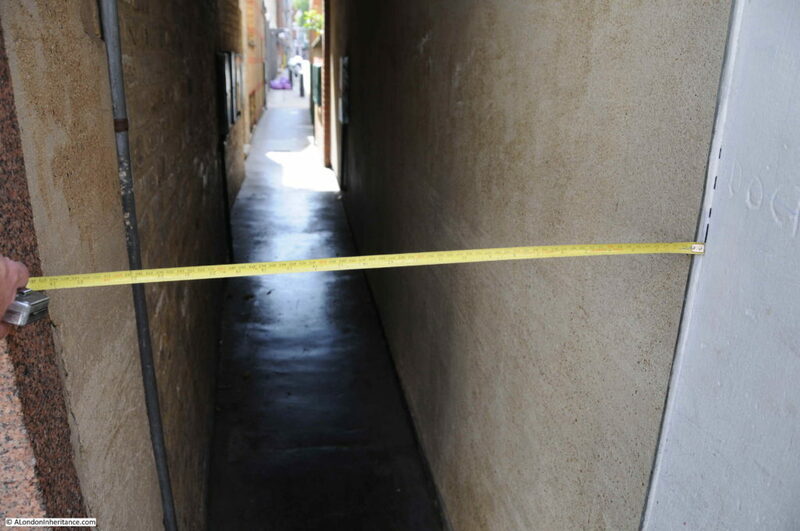 Not sure if it is the narrowest in London but 68 cm is not that wide. Walk through the alley and this is the view back towards Rugby Street. Emerald Court opens out into Emerald Street, a street of mixed architectural styles, but generally later than the early 18th century buildings of Rugby Street. Emerald Street runs all the way down to Theobalds Road. I mentioned earlier in the post that Rugby Street was built as part of the early 18th century, northern expansion of London and a look at John Rocque’s map of London in 1746 shows this perfectly. I have ringed the location of Rugby Street and a very short distance to the north is the Foundling Hospital surrounded by fields. The road on the right heading north through the fields is Grays Inn Road. As with so many London streets, these have undergone some name changes. 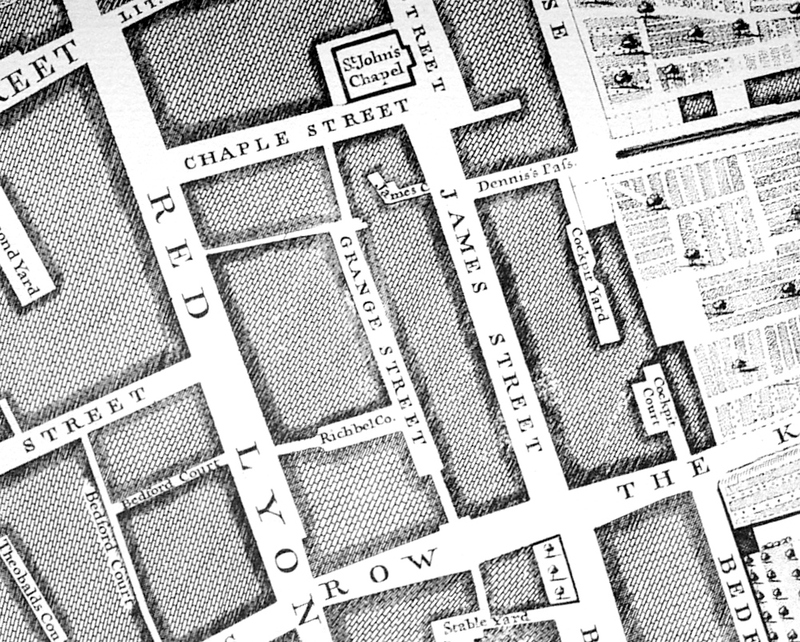 In 1746 Rugby Street was named Chaple Street after St. John’s Chapel which had been built on the north east corner of the street. The map below provides a detailed view of the area. Chapel Street (Rugby Street) has the chapel on the corner, this was demolished in the later part of the 19th century. Chapel Street was renamed Rugby Street in the 1930s. 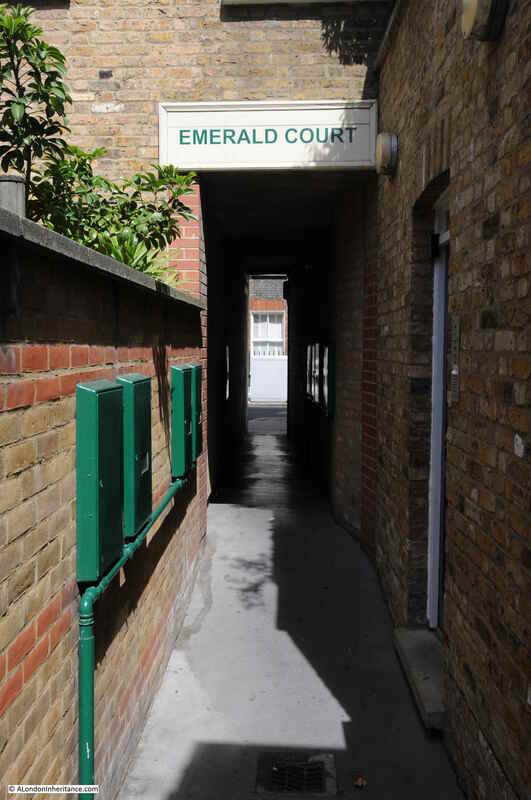 Emerald Court is an original feature having been in existence in 1746. Emerald Street was originally named Grange Street so perhaps Emerald Court was Grange Court, however the name change from Grange to Emerald pre-dates the name change of Chapel Street as in the 1895 Ordnance Survey map the names Chapel and Emerald are in use. I have been building a spreadsheet of London street name changes for my own reference as there are so many, I will upload to the blog sometime. 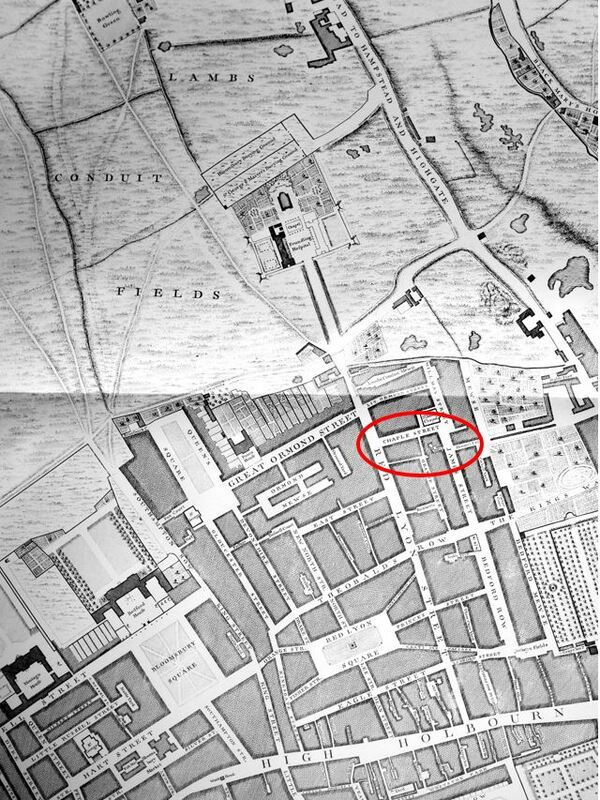 The map extract below shows the area today with the street layout very similar to that of 1746. Emerald Court is the dotted red line leading up from Emerald Street. Although the name change from Chapel Street to Rugby Street is relatively recent, it does have significance to the history of the area. Prior to the start of building in this part of London, much of the land was held by various estates. 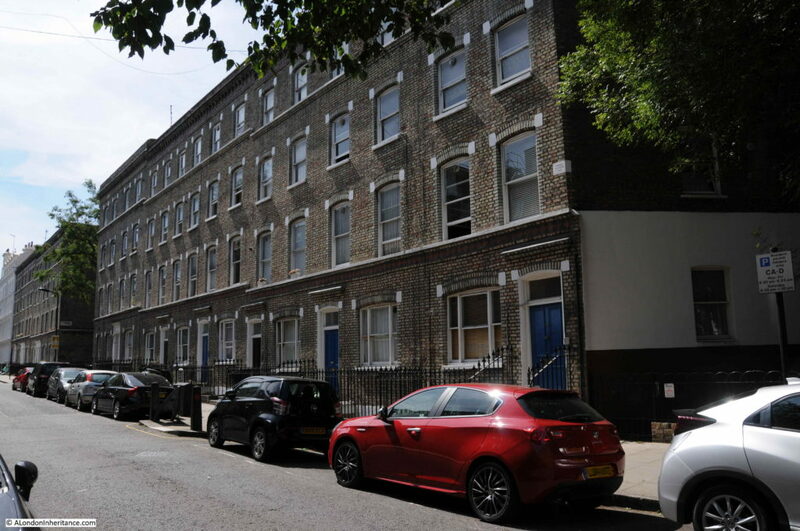 I have already written about the nearby Bedford Estate, and the land around Rugby Street and Emerald Court was part of a bequest by Lawrence Sheriff, a London grocer who was originally from the town of Rugby. In 1567 Lawrence Sheriff’s bequest enabled the building of a school and almshouses in Rugby – the school now known as Rugby School. As well as Rugby Street, the bequest included the land now occupied by Lambs Conduit Street, Millman Street and part of Great Ormond Street. The estate remained intact for centuries however the 1970s were a difficult time for the estate (as it was for so much 18th century housing in London) with many of the buildings falling into disrepair and low rents unable to fund the significant repair and reconstruction costs. 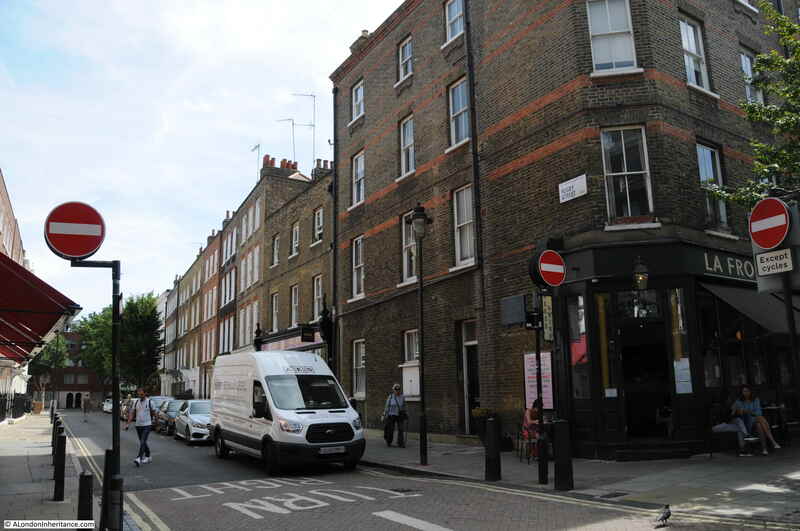 A number of properties in Great Ormond Street and Millman Street were sold to Camden Council, however much of the estate remained with Rugby School, centered around Lambs Conduit Street. The rental from the houses, shops and pubs on these streets is still going towards Rugby School as Lawrence Sheriff intended 450 years ago. His name is also on the Rugby grant maintained Lawrence Sheriff School which receives a percentage of the rental income. There is a plaque on the corner building on the right. 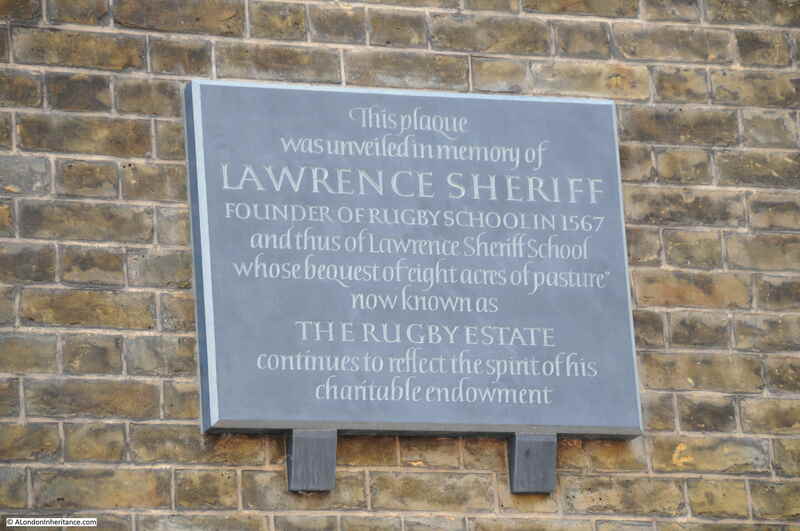 The plaque records the bequest of the land which enabled the founding of Rugby School. 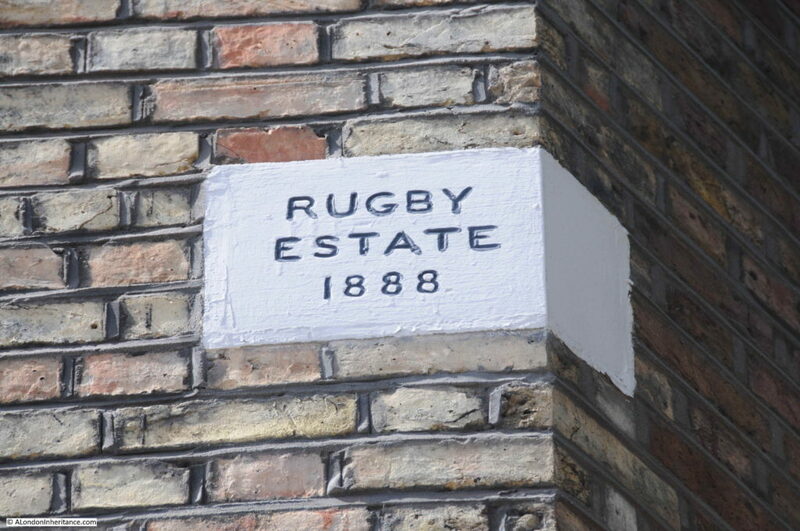 It was unveiled on the 28th April 2017 to commemorate the 450 year anniversary of the founding of Rugby School, which would not have been possible without this area of land in London. The Rugby name appears in a number of other places. 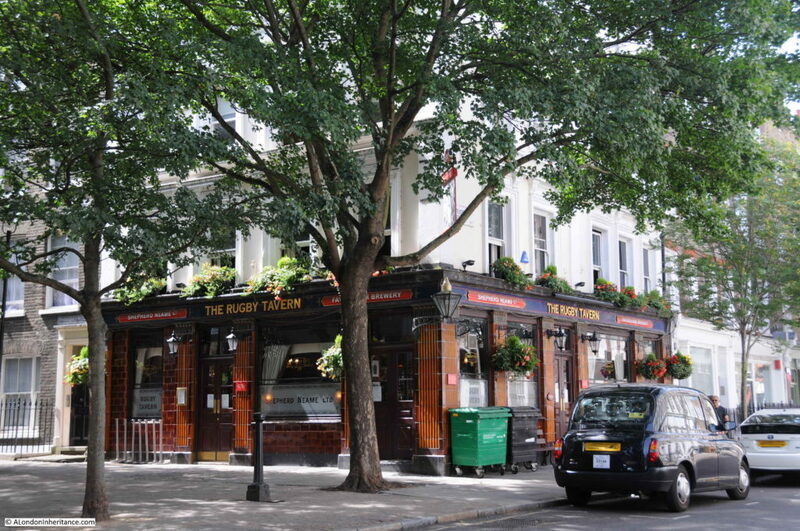 At the eastern end of Rugby Street is The Rugby Tavern which dates back to 1850. These estates would frequently have boundary markers to show which streets belonged within the estates so I had a walk round to see if I could find any. 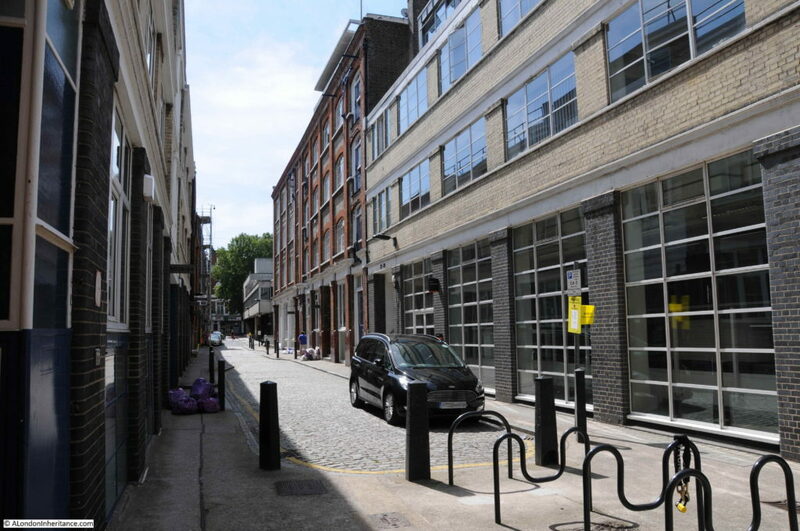 I will map all these in a future post, however here is one on the corner of this terrace in Millman Street. Close up of the boundary marker in the photo below. Although the estate is much older, the boundary marker is dated 1888 as markers would be frequently renewed during periodic boundary checks and as new houses were constructed. 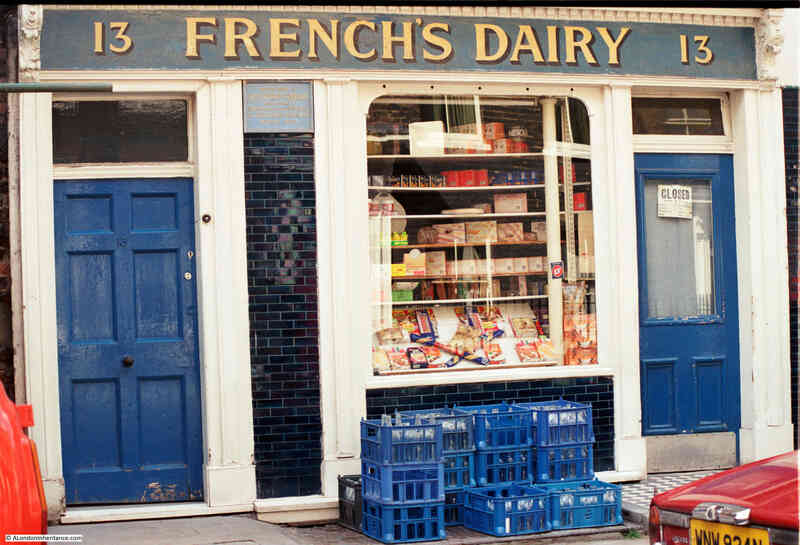 The photo of French’s Dairy (the reason for visiting Rugby Street) only dates from 1986. Thirty two years is trivial in the 450 years of the Rugby Estate, but to me it seems a lifetime ago. Back in 1986 I was driving a leaky Triumph Spitfire (leaking water in from the soft top, and oil from the engine). I was taking photos on film with digital photography in the distant future, and probably listening to The Damned, Level 42 and the B-52s on cassettes in the car. 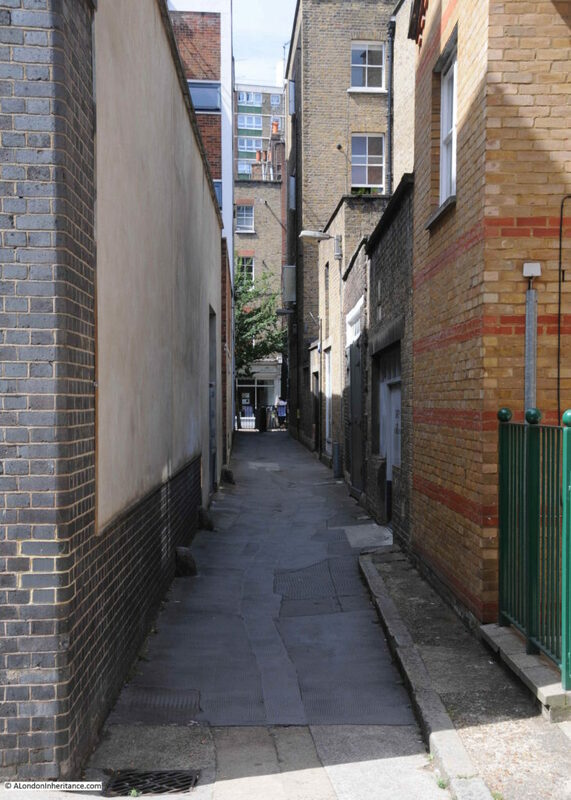 I will re-visit the Rugby Estate, and also have a target to map out all the estates in this part of London so I will be walking these streets again. This entry was posted in London Streets and tagged French's Dairy, Rugby Estate, Rugby Street on November 18, 2018 by admin.